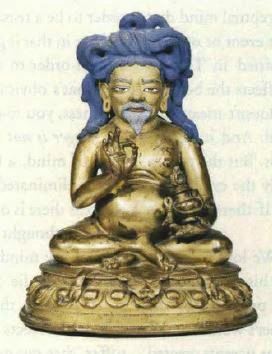 Image of Tangtong Gyalpo holding a medicinal pill and longevity vase. Fifteenth century image in the Potala collection. Photo courtesy of Ulrich von Schroeder. Tangtong Gyalpo was the greatest engineer in Tibetan history, one of its most prolific architects, and an innovative artist. His many iron bridges, monasteries, and stupas have enriched Tibetan culture for over five hundred years. The extent to which he changed his country’s spiritual topography through concrete activities based on mystical theory remains unparalleled in Tibetan history. Tangtong Gyalpo built his first iron suspension bridge over the Kyichu River near Lhasa in Central Tibet in 1430. From that time he was famed throughout Tibet and the Himalayan regions as the “Iron- Bridge Man.” In addition to iron bridges, he built many stupa monuments to tame hostile influences, prevent natural disasters, protect against disease, and avert invasion by Mongol armies. These stupas were constructed in Tibet and the borderlands according to geomantic principles, and were situated at strategic locations to serve as environmental focal-points. A number of Tangtong’s monasteries and temples were placed according to the same theory. Read to the complete article as a PDF.